If you’re wondering where you should be focusing your IT content marketing dollars this year, you’re not alone. There are all kinds of services promising great results for whatever it is they sell; but that doesn’t tell you how your target market will react to it. At ActualTech Media, we figured the easiest way to find out what may work is to just ask our huge audience of IT pros and decision makers exactly what they find useful and what they ignore. We polled our audience to find out how they feel about the standard stable of IT marketing tactics and assets. The overwhelming feedback we received reveals six key areas we recommend that our clients invest in, and three that are little more iffy in terms of bottom-line results. Webinars top the list of ways that both IT pros and decision makers seek to learn about new technologies, and how they evaluate new technologies for potential use in their companies. It’s clear that these kinds of events, which become content assets, are incredibly powerful. Tip: In our experience, webinars that focus on solving a real-world problem are the sessions that build the most opportunities and pipeline for our clients. We’ve seen our clients consistently outperform on webinar programs when they craft their webinar messaging around “here’s the problem we know you have / here’s how we help”. Focus on that approach and you’ll hit the mark with IT audiences. No one can dispute the power of video today. It’s one of the most effective ways to get your message across to a potential customer. 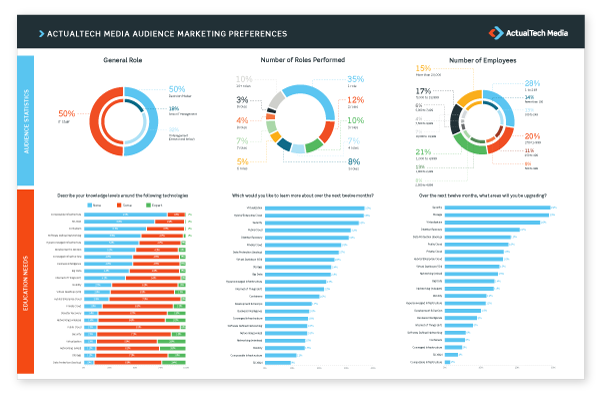 After webinars, videos are the second most popular way the ActualTech Media audience prefers to learn about new technologies. More than 90% of our respondents find video to be compelling opportunities to learn about your solution. You might be thinking, ‘Great, but what kind of video?’ Good question! We dove deeper on this and found that the audience ranked “Interview with a vendor technical expert” as the most valuable kind of video by far. That means shooting more video (even simple two-minute industry ‘shower thoughts’ videos) with your technical SME’s and Evangelists can go farther than you think. After these, whiteboards and animated explainer videos came in next. Tip: What videos does the audience least want to see? Sadly for the C-Suite, videos with vendor executives ranked last. That doesn’t mean there’s no place for the senior execs join the video party though: have them join the technical folks on their discussions and chats and bring their perspective from the business side of IT to the table. Decision makers will take note. Sometimes, a short article isn’t enough to properly educate an audience about your solution. These situations require something longer and more in-depth. That’s where short-form eBooks, like the Dummies or Gorilla Guide Series books from ActualTech Media come in. As the table below shows, these eBooks remain highly popular with both IT pros and IT decision makers. eBook PDF’s are still going strong! Gated PDFs on the web are a staple of technical marketing, and it’s great to see they’re still getting in-depth attention after all these years. Books and eBooks allow you to go deeper into the topic area and present your technology as a unique solution, including an overview of your architecture and methodology. eBooks give you the extra breathing room you need for this vs. a standard white paper. Tip: Our clients have found that actual, printed copies of these books fly off the shelves at trade shows and meetups. 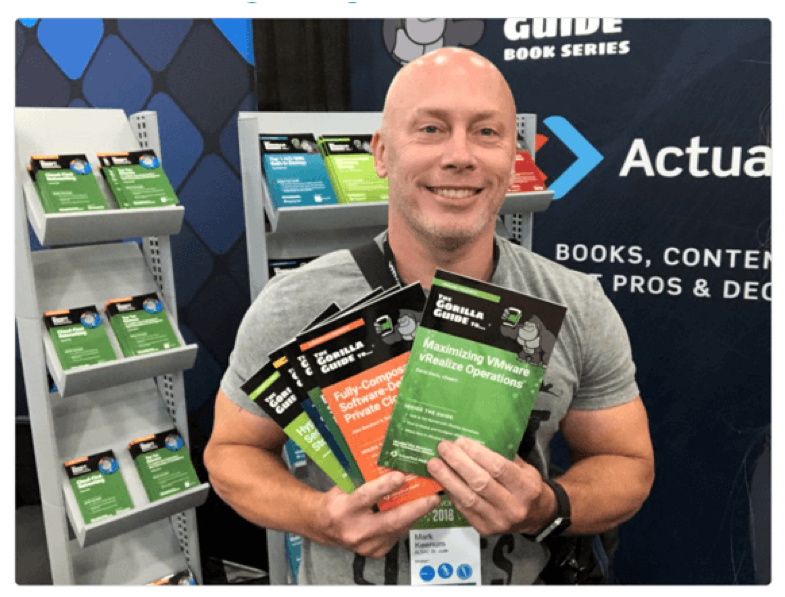 At VMworld this year, we stood up a quick booth to get our clients’ Gorilla Guides into as many hands as possible and we ended up giving away 7,000 copies! White Papers: the original ‘content marketing’. Particularly as buyers go farther down the funnel and start to look more seriously at solutions to their challenges, if you don’t have a solid “Resources” section on your website with a variety of both in-house and independently-authored whitepapers, you’re not going to show that you’re ready for ‘prime time’. White papers remain well-liked by both IT pros and IT decision makers. They’ve retained their value over the years, demonstrating their usefulness to organizations. Prospects want to see themselves in the marketing material you create: they want to be able to identify with the subject. 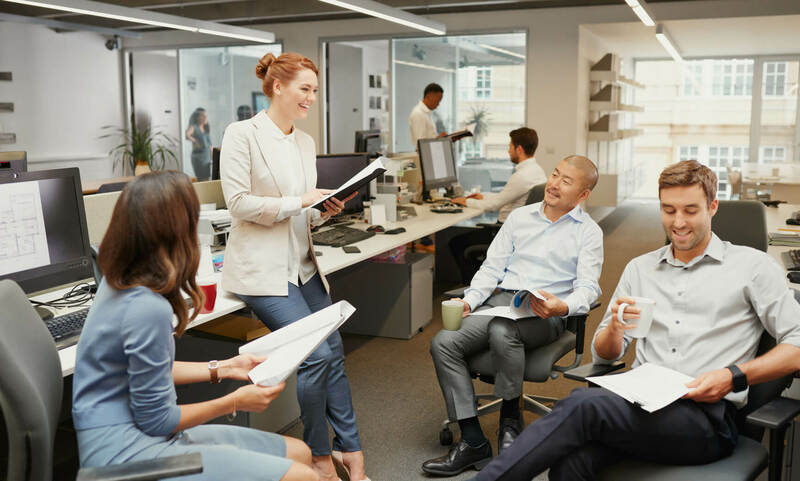 Case studies are a great way to do that, especially for IT decision makers, of whom 75% say that they find case studies to be a useful tool when they’re considering a solution. Where do you start when it comes to creating case studies that make the case for your solutions? Blogs have been around forever, but they remain popular with both IT pros and IT decision makers. They’re generally relatively easy to write and, if you maintain a consistent publishing cadence with great content, you can quickly gain a strong following of readers that want to learn from you and understand your products and solutions. Around 70% of both IT pros and IT decision makers find blogs useful as a way that educate themselves. In talking with our clients about blog content over the past year, we’ve noticed a recurring theme that has held them back from executing on their blogging strategies: humans. More specifically, over-stretched humans with no time to blog. This includes everyone from technical staff to executives. Worse yet, when they’ve thought about outsourcing blogging in the past, they hit the wall when they realized the time it takes to educate a writer or blogger on their technology and voice, it always ended up being easier to do it in-house…but then, once again, no one has the time. Tip: To help with this, ActualTech Media launched a Content-as-a-Service offering for selected clients. Given that we already have the expertise in 95% of the technology, we just needed a briefing or two to get up to speed on how our clients architect things and we hit the ground running, providing monthly blog posts that are engaging readers and freeing up our clients for additional strategic initiatives. To help our clients get the most for their marketing spend, we also needed to understand where our audience starts to drift off to sleep. We decided on a cutoff point of 65% usefulness for making recommendations around where to focus content spend. For a while, infographics were all the rage. But the market was plagued by infographics that just didn’t hit the mark, were ugly, or didn’t convey information in a meaningful way. As a company, we still find good infographics to be useful, but our audience is of a different mind. Just 60% of IT pros and 63% of IT decision makers find infographics valuable tools these days. There are definitely better ways to stretch your marketing dollar. Tip: For 2019, we recommend our clients take the concepts they were going to use for infographics and re-purpose them into whiteboard animations, whiteboard videos with a technical expert, or videos with chart graphics and takeaways super-imposed on top of live discussion. Infographics used to be an SEO link-magnet, but have been overused to the point where a certain blindness is setting in. Social performance of infographics is also on a downward trend as attention spans move to video. There’s a podcast for everything. It’s tempting to want to jump in and create a company podcast to participate in this community; and given sufficient time and personnel resources, it may be valuable. But for companies looking for ways to do as much as possible with their budget and internal resources, creating an asset that is enjoyed by less than 60% of the target market may not be the best use of time and effort. Unless you can find a way to re-purpose other content into a podcast without having to do a lot of work, think long and hard about whether it’s worth it for you. This one fell as flat as a manhole cover. At first glance, ROI and TCO calculators would seem to be an incredible resource for people considering your solution. The reality, it turns out, is very different. Just 40% of IT pros and 53% of IT decision makers find these resources valuable. The problem often comes from the trust factor: customers don’t trust these until they know they know you as a vendor. Before that, everything is viewed with suspicion, and the fact is that these resources are often looked at as unreliable, due to bias. The assumption is that the calculator may distort reality to show your solution as favorable in as many cases as possible. We have seen some really good – and stunningly bad – ROI/TCO calculators over the years. The unfortunate truth is that the stunningly bad ones have tainted the pool for the good ones. We strongly recommend investing in case studies or similar assets over ROI and TCO calculators. We all need to spend our marketing budget wisely, and while marketing gurus may shout from the rooftops that ‘this is dead’ or ‘that is dead’, data-driven marketers know it’s not that simple. Tried and true tactics still drive leads and pipeline, what matters is how you execute on them. Tip: Don’t discount the validation and weight that 3rd parties bring in the mind of the IT buyer. In-house content is essential, but more often than not, content, videos and assets developed by trusted 3rd parties help open more doors in all segments of the funnel. We hope this feedback from our audience of IT pros and decision makers has helped provide some direction to your content marketing efforts in 2019! 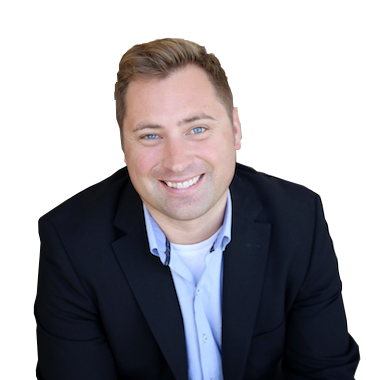 Want to drive webinar leads? Our MegaCast and EcoCast multi-vendor webinars drive anywhere from 400 to 800 leads in a single event! See the upcoming schedule here. Arrange a quick chat with us. We’re always happy to jump on a quick call and learn about your plans and how we can help! Drop us a line here to arrange.